Winter stops may be a little quicker, but the heated pool feels great year round. The slopeside location means stunning mountain views. Grab a spot fireside while the rest of your crew shops for souvenir t-shirts and keyrings. Line up the toppings on the table and let the kids go for it. Taking a break from the slopes and trails? Get a great workout in at the fitness center. The ski-in/ski-out location means you can linger a little longer over breakfast. Ski-in/ski-out access? Let's hear it for hassle-free. Mountain views and Canyons Village location make the location a win-win. The heated outdoor pool welcomes guests all year round. Feeling a little beat up from your spills on the slopes? Head for the hot tubs. Hit the Round Valley trails in search of cool sticks and (if you're lucky) critters. Just 2.5 miles away. Both Canyons Golf and Park City Golf Club are less than a 10 minute walk. See if you can grab a last-minute tee time. Tucked conveniently at the base of Canyons Village, Sundial Lodge is just steps from the Red Pine Gondola, ready and waiting to whisk you up the mountain. You’ll appreciate the ski-in/ski-out location a little more each day, as it takes you slightly longer to rally the troops in the morning – those days on the slopes have a way of wearing you out like little else can. You’ll find ski and souvenir shops on the ground level and in the adjacent buildings, where you can easily pick up a replacement for that gaiter or glove that got dropped off the lift or left at your lunch table. Make your way to the heated outdoor pool, or stop by the third floor hot tub, plunge pool and fire pit before deciding on dinner plans. Take a family vote on nearby restaurants (and hope for a majority), on those nights when cooking seems like more work than you’re up for. The complimentary shuttle service will zip you around Canyons Village, and even over to historic Main Street in Park City, if you’re feeling adventuresome. Utah’s legendary powder is a given, but the Canyons Village area right outside keeps its steady rhythm going all through summer, with nearby outdoor concerts and a summer farmers market. Nearby Canyons Golf Course is Utah’s newest course, designed by Gene (and nephew Casey) Bates. 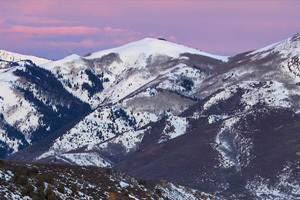 It begins near the Orange Bubble Express Lift and offers breathtaking views of the Wasatch and Uinta Mountains. Check out the local family putting course, go horseback riding or take the High Meadow Lift to play the mid-mountain alpine disc golf course (free with gondola ticket purchase). Already burned off that early morning breakfast? Stop by Murdoch’s for more coffee and a breakfast burrito. Foodies in your crew? Try The Farm, one of Utah’s Top 10 restaurants, complete with award-winning wine list. Located in Park City, Utah. The largest mountain resort in Utah, featuring nine peaks, 182 trails, six natural half pipes and terrain for every ski ability. Home to Orange Bubble Express, the only heated-seat, enclosed chairlift in North America.